The 200 sq.m. house is arranged over two floors with the main entrance inside the monastery precincts and a secondary entrance up some steps from ground level outside the monastery. 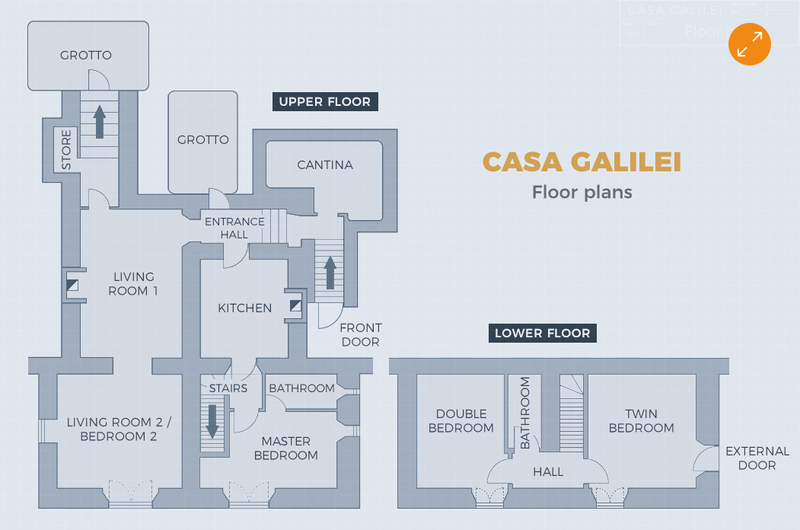 For under­standable reasons, many potential guests have difficulty visualising the layout of Casa Galilei. The downstairs area is smaller and straight­forward but the upper level is relatively complex, so a floor plan is shown here. The original house is around 400 years old and approached from within the monastery precincts down a flight of stairs, almost like entering a hobbit’s house: the small entrance gives no clue as to what lies within. The stairs will be no obstacle to older children and moderately active adults (80-​​year-​​olds have been known to navigate them with ease) but might be a bit tiresome for people with younger children and buggies. The pedestrian-​​only Rocca, where the house is located, is also a warren of picturesque stairways and alleys and this is worth bearing in mind if your mobility is limited. Casa Galilei was formerly the guest quarters of the monastery that used to occupy the Rocca. Part lay within the monastery walls, while what are now the bedrooms and bathrooms were an ancient external addition. Until recently, the guest quarters had lain derelict for over a hundred years and the sole inhab­itants were a donkey and a flock of chickens in one of the small caves and some bats in another. The internal rooms were in a poor state of repair while the external part was falling down, as you can see in the second photograph in the slide show below. Several fig trees had taken root in the ruins. Local artisan Mimmo rebuilt the external walls and windows to the original plan and he and his brother manhandled enormous beams into place using a pulley system (as the original builders must have done) and put the roof on. Then all the rooms were fully restored and equipped with every modern comfort, while retaining as much of the 16th-​​century plan as possible, together with many distinctive features. The photos below show the rear exterior before and after restoration. The metre-thick walls are great for keeping out the heat of high summer, and the windows on the lower floor have internal shutters too. The full-height windows on both floors of Casa Galilei overlook the Santa Lucia valley. In April and May the valley is full of cuckoos calling and other birdsong can be heard throughout the year. Sometimes you can see and hear the owls hunting at night. Wild boar also live in the valley and in one memorable year came up to the village square to forage for food. If you were to stay at Casa Galilei for 12 months – and you might be tempted to! – you could watch the sun set over the other side of the valley at a different point every evening. For the first half of the year it sets a little further north each day, and then moves back again after the summer solstice. Of course, everyone knows the sun behaves this way in the northern hemisphere but rarely does one benefit from such a perfect observation point, particularly satisfying with a glass of prosecco or spritz in hand.